Steve enjoyed a long and fruitful relationship with the company Benchtours, composing and playing music for seven shows. This included writing new scores for two plays by Bertolt Brecht, “The Caucasian Chalk Circle” (with cello) and “Mother Courage and her Children” (with accordion), and Ibsen’s “Peer Gynt” (with cello). 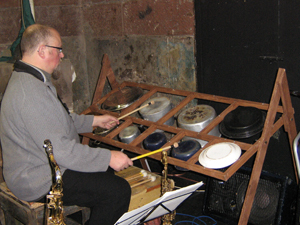 “Carnivali” employed a mixture of live saxophones with electronics and recorded tracks. In all these productions Steve took on acting roles as well as performing the live music. A reworking of Lewis Carroll’s stories, “Alice”, used recorded music with live voices; and “Paste”, a show with community groups in Aberdeen, used recorded music only. Percussion always played a large part of the onstage sound, and for “Mother Courage” Steve and designer Gordon Davidson built a rack of pots and pans, which came to be known as the “tenpani”. The final number from “Paste”, renamed “Fanfare for Mr.C” when adapted later for the Cauld Blast Orchestra. “OK Croquet Rap” from “Alice”, sung by the Queen of Hearts (Catherine Gillard) and the company.